Shipping via truck freight at a flat rate of $149.00 to a COMMERCIAL ADDRESS with a BUSINESS NAME. Shipping to a residential address requires the “Residential Delivery” option to be chosen or your order will not ship. 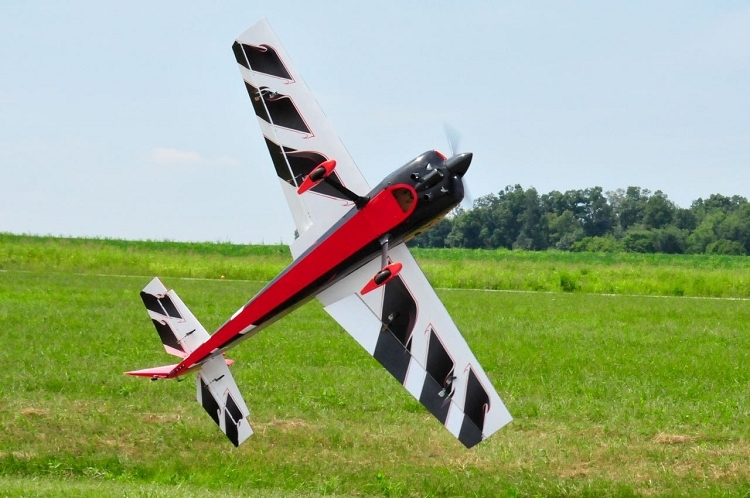 The 3DHS Demonstrator Edge 540 was unveiled at the 2015 Joe Nall event at Triple Tree Aerodrome. When 3DHS and EF joined forces we wanted to orchestrate a new project to show what was capable when the two companies put their heads together and shared the combined knowledge from decades immersed in the hobby. The Demonstrator features many forward thinking ideas and concepts that make it a truly unique model among the current ARF offerings. It features an amazing color scheme designed by Arron Bates that takes full advantage of the new photo-realistic print technology we have pioneered. Carbon ghost flames, pinstripes and fades that are reminiscent of a custom painted hotrod are all part of what may be the coolest ARF color scheme ever produced! And just wait until you pull the canopy off and look inside! Carbon fiber everywhere! A large portion of the interior is made from carbon fiber laminated plywood and features carbon fiber longerons, carbon fiber laminated wing root, carbon fiber wing tube, stab tube, main gear, tailwheel and a specially painted carbon fiber spinner to match the color scheme. If you want a model that truly represents the pinnacle of ARF technology and flight performance and is sure to turn heads at the flying field, the 3DHS Demonstrator EDGE 540 is the one for you! 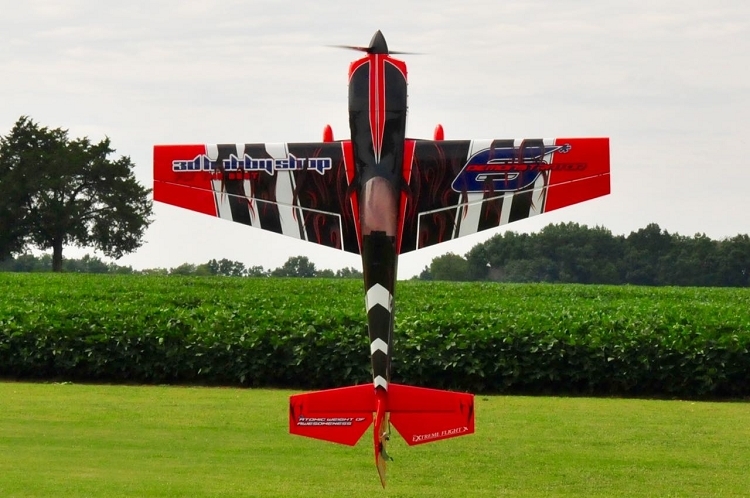 The Edge 540 is a legendary full scale aerobatic aircraft, unique for its distinctive straight leading edge wing. Nothing else looks like an Edge in the air. The wing design, however, is not just for looks. The straight leading edge and forward swept trailing edge give the wing distinctive flight characteristics in 3D flight. You'll notice easier, more instinctive, and smoother harrier flights, as harrier turns, even tight ones, require less compensation from other controls. The result is a big friendly airplane that you can toss around down low with total confidence. The Edge is also long, with an advanced tail design that gives excellent tracking. 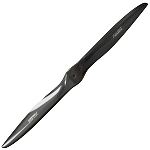 The Edge is capable of extremely precise flight and has a wide speed range. Landings with the Edge are no-drama, it just floats in slowly and predictably. The 106" Edge is matched up well with all of the popular 100-120CC twin cylinder engines, depending on parts chosen expect weights 26-28 lbs for common setups. The Edge can utilize all common exhaust setups with a large exhaust tunnel area. ...and more. 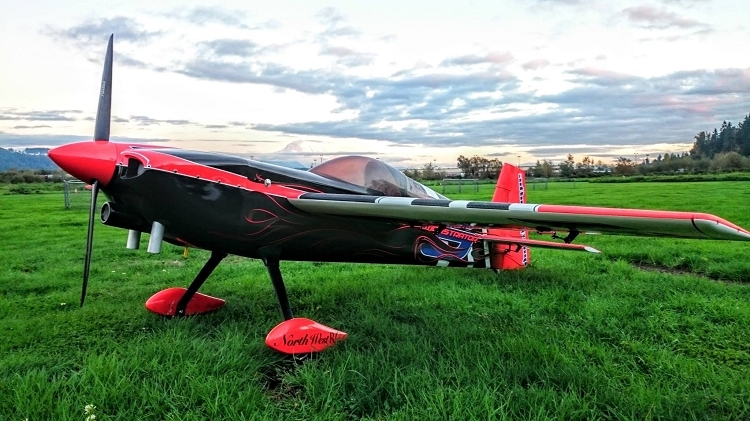 For a super-friendly and super-high-performance aerobatic aircraft, you need a 3DHS 106" Edge. All the great characteristics of the other 3DHS Edges in a complete, high quality 35% package! Metal gear-high torque servos are required. Minimally, you will need a digital metal gear servo with at least 250 oz-inches of torque for each of the 7-10 servo locations. For best performance, 290 or more oz-inches of torque is recommended. The 333 oz-in Hitec 7955-TG or 7954SH are excellent choices. For the best possible performance, consider the MKS HV777 or HBL380 Brushless servo. 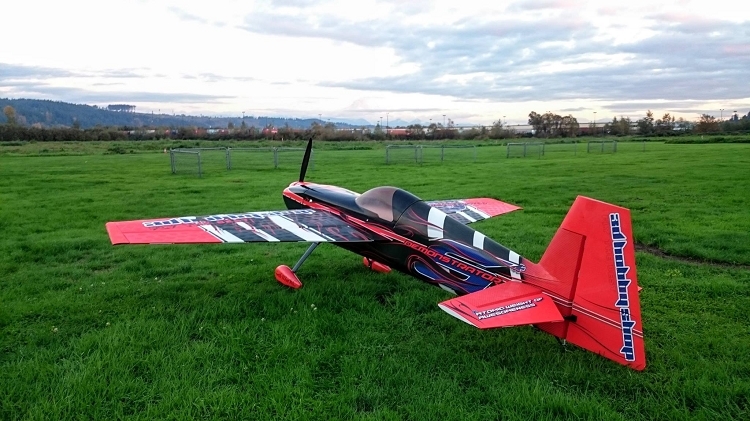 Jase Dussia flying the 106" Edge 540 Demonstrator. Jase Dussia and Andrew Ritschel dual 106" Edge 540 Demonstrator flight.